Tucker Bay Spring seeps from a linear crack forming a full-blown creek in a few feet. Interesting Information: Very little is known about this spring, either geologically or historically. The spring rises along the lower one-third mile of an intermittent stream, at the base of a hill. It seems to come from a fault or joint, which begins as a trickle, and has its largest flow from beneath a jumble of breakdown about 2/3 of the way to the nearby Current River. A large sinkhole to the west is presumed to be related, but no tracing has been done. Brief History: Unknown. 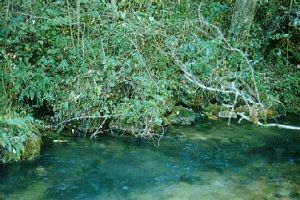 The spring is a boggy, low area (locally known in the Ozarks as a 'bay') and seems unlikely to have ever been used for recreation. 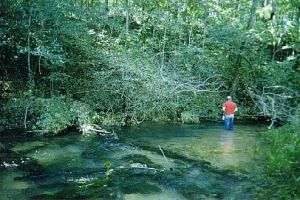 Located in Mark Twain National Forest, land immediately adjacent is being managed for timber. Six flow measurements have been taken on the spring from 1945 through 1964. Only one descriptive report, in 1988, by the author of this page, exists in state files. If anyone knows more about this spring, please contact joschaper@socket.net. Ownership and Access: Owned by U.S. Forest Service. Access is by bushwack hike. Topo map required. Not a fee area.